Whether you are looking for an economical printer for home or business use, a monochrome printer offers you the perfect solution. But just what is a monochrome printer? Learn about this office appliance and other benefits it can fetch you in this article. If you foresee doing a lot of prints in black and white, then a monochrome printer is what you need. It is the kind of printer you often find in most offices. It is the go-to printer for many companies as it is fast, cost-efficient, and built to take on a large workload. And like colored printers, monochrome ones can come as inkjet or laser types. Why Go for a Monochrome Printer? While a colored printer can definitely handle the same printing applications as that of a monochrome printer, the latter is preferred to print research papers, company letters, presentations, and business literature that do not require color. However, research shows that colored prints have more power to grab the reader’s attention. So, depending on your goal, you might be better off turning on and running that colored printer. Generally speaking, monochrome printers are more affordable than their colored counterparts with less to no time needed to mix colors. Understandably, colored printers offer more versatility, allowing you to print in black and white or greyscale as well. Nevertheless, the price of the printer is not something to worry about since the price gap is not that huge, to begin with. In fact, if the price is a primary concern, then you’ll be better off with a colored printer since you’ll be able to do black and white prints and colored ones using one office appliance. Plus, with all the options available, you are sure to find one at a comfortable price point. However, if you do a lot of black and white printing as you might expect in an office environment, then monochrome printers offer you a more cost-effective solution. The price difference between cartridge or toner ink for monochrome printers and colored ones can add up significantly over time. In a fast-paced setting such as a company office, workhorse printers are your best friend. And it is in a monochrome printer that you can find one. That’s not to say that there are no colored printers with high ppm (pages per minute) rates. There are as long as you are willing to spend more. But with that price, it would have afforded you a much higher ppm already in a monochrome printer. Additionally, if speed is a primary concern, then take note that a laser monochrome printer finishes faster than an inkjet one. The fastest we have found so far is from Lexmark International, Inc. that can do 70 ppm. One Brother model can do 100 ppm, but production for this office appliance has been discontinued. What Are the Features to Look for in a Monochrome Printer? A printer’s dpi (dots per inch) tells you of the quality of your prints. A printer that prints at 600 dpi means you get 600 dots vertically and 600 dots horizontally per square inch. Take note that other printers have higher resolution in one direction. Thus, you can find a resolution value expressed as 600 x 1200 dpi, for example. In principle, the higher the value you see, the sharper the texts come out. However, depending on what you’re printing, a very high dpi can be overkill not to mention costly. For regular texts such as letters and business documents, a 600 dpi should render the texts sharp. Meanwhile, 1,200 dpi is good to print quality images. However, for professional photographers, they would need a printer that can print in 2880 x 1440 dpi or higher for great looking prints. Additionally, in typical business settings, a laser monochrome printer is in order. Inkjet monochrome printers tend to come out with softer edges while texts look crisper on paper with laser printers. With the high volume of printing done in offices, a fast monochrome printer translates to better productivity. Generally speaking, inkjet or laser monochrome printers are faster than colored printers. To know how fast a prospect printer can go, you should be looking at its ppm value in the specs. Speed can go from as low as 1 ppm to as high as 70 ppm. In a high-speed environment, fast printing should be complemented with a large paper input capacity. Thankfully, aside from a high-volume paper tray, some monochrome printers have one that is expandable. Be ready to reserve a spot for such printers. Bulkier and heavier, they have a larger footprint. Another useful feature that you need to look at is a printer’s capacity to print on the back and front pages at the same time. This is a time-saving, budget-friendly, and eco-friendly feature. It is also useful when you are printing handbooks, booklets, and the like. 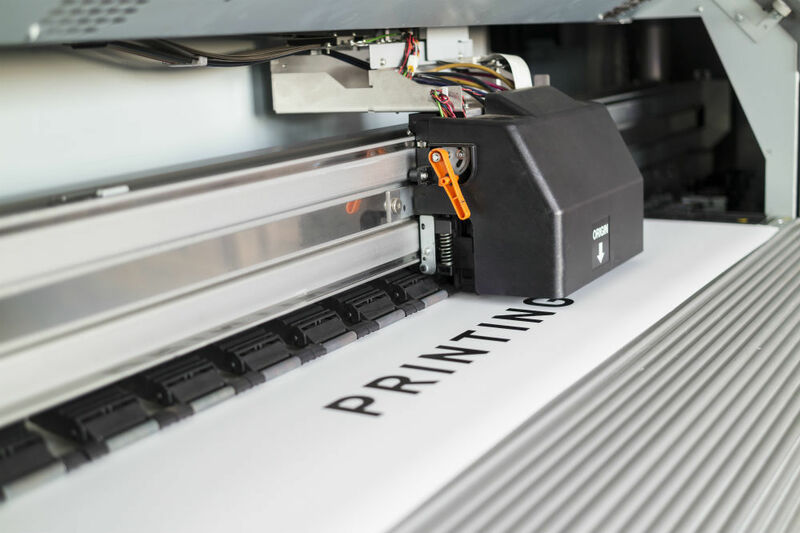 The type of connectivity technology your printer is designed with determines how fast and efficiently you can send data for printing. Additionally, it allows many people to connect with and use the printer while not being physically connected to it. NFC, WiFi, and Bluetooth-enabled printers offer you the some of the fastest ways to turn soft copies into physical ones. Do you frequently use paper of different sizes, envelopes, and labels? Then, you’ll have to check if your prospect printer allows that. Some printer comes with an adjustable feed guide, multiple paper trays, or optional feeding units. We hope that explains what is a monochrome printer and that we have given you a few pointers in finding one that’s perfect for your needs. Whether you are looking to use it for home office or business needs, you’re sure to find one that meets your quality and speed requirements at a comfortable price point.